Animals are born with a pure heart to provide unconditional love. However, sometimes circumstances make it hard for these amazing creatures to do so. At ACAR, we are dedicated to helping animals achieve a happy, healthy life. By rescuing animals from a variety of situations — death or relocation of their owner, abandonment, abuse, and more — we can rehabilitate them and re-home them to loving families looking to adopt a pet. Many of the animals we assist come from individuals placed in hospice care who can no longer look after their beloved pet. Regardless of the situation, the kind people at ACAR are committed to finding loving, nurturing, furever homes for all pets. Please contact us today to find your furever love! Help us find a new home for our amazing rescue animals. The founder of All Creatures Animal Rescue (ACAR) was called to help animals after living a long and successful career in healthcare and family medicine. She owned a petting zoo and dog showing business in the 90s. Her dad was a California State Park Ranger who taught her and instilled in her the nurturing gift of loving and appreciating the fur creatures, reptiles, birds and fish God created just for us. Barbara Reagan has pasionately and fervently pushed for advocacy and rescue from an early age. In the 70s she worked at the West Los Angeles Animal Shelter as her first job. In retirement she has now discovered the amazing blessing of being a grandparent and advocate for animals. After she helped rehabilitate a young puppy, she realized that she had found her purpose. 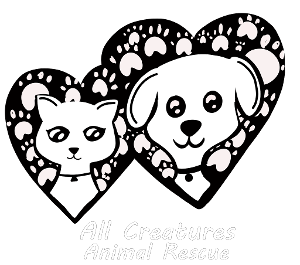 Since then, All Creatures Animal Rescue has been proudly supporting animals and animal lovers in our community of Rancho Cordova, California, and beyond. As an animal rescue organization, our positive influence has reached people all across the United States.